Visiting diving groups may use the facilities with prior agreement with the owners. This can be either by directly contacting Salen Pier Ltd or when booking one of the adjacent houses, Salen Pier House or Salen Pier Lodge or Glenview Breaks. Boat charter is available locally from Lochaline and Tobermory. 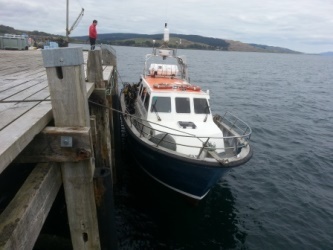 These vessels land at the pier when using the local accommodation, or with prior agreement. Lochaline boat charter is used regularly by diving groups. Hispania: This Swedish merchant vessel (644 net tonnes) sank in 1954. This wreck remains fairly intact and although she is gradually disintegrating with time, she remains one of Scotland's finest wreck dives. The amount of marine growth over the hull during the summer months is quite exceptional. A slack water dive. Shuna: Wrecked in 1913 while carrying a cargo of coal, the steel steamship Shuna, built in Holland (880 net tonnes) was discovered in 1991, and lies intact and upright in 30 metres (16 metres to the deck). The wreck is diveable at all states of the tide. Fuinary Rocks: An interesting scenic dive inside of the navigation marker amidst a series of reefs and gullies close to the shore. Plenty of life among the rocks. Rondo: Wrecked in 1935, this tramp steamer (2363 gross tonnes and 80 metres in length), lies bow down in 54 metres on a steep slope with the stern in 9 metres. The ship is still reasonably intact and there is a route between the keel and the rock face at about 27 metres. A slack water dive. Pennygown Quarry: Running out from the shore, the sand slopes down to 20 metres before hitting a sheer cliff-face to 70 metres. Rock strata here run diagonally, forming lots of crevices for marine life. John Preston: The wreck of the Welsh Schooner John Preston, built in 1855 in North Wales, lies on a ledge in 14-18 metres of water. This scattered wreck, and the steep wall nearby, make for an interesting dive at all states of the tide. 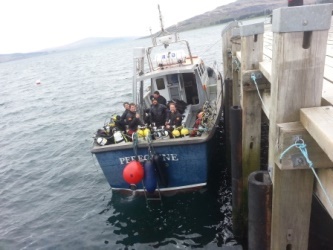 Lochaline Pier: This is an excellent shore dive on a drop-off to over 90 metres. Sponges, anemones, soft corals and lots of fish make this a very enjoyable dive. The site is well known as a deep dive training location. Lochaline Hotel Beach: Another shore dive and a variation of Dive No.1. The sandy beach in front of the hotel shelves gradually off onto a steep wall, but the lagoon area, with its sandy bottom and interesting marine life makes a good training site for inexperienced divers. Avon Rock: Shallow reef inshore of the red navigation marker directly opposite Lochaline. Boulders, crevices, and a steep slope to 50 metres on the outer side provide an interesting scenic dive. Evelyn Rose: The Grimsby Trawler Evelyn Rose (130 net tonnes) was wrecked on Ardtornish Point in 1954 with the loss of all but two of her crew. To the best of our knowledge, this wreck lies in deep water and has not been found. Ardtornish Bay: Often a productive scallop dive where gravel and mud lie on the flat gradual sea-bed gradients of the inner bay. For a good scenic dive, follow the boulder slope inshore from Ardtornish Point towards the bay. Be aware that strong currents can occur around the point and plan any dive here carefully. Scallastle Bay: Marked on old charts as an Admiralty Anchorage Area, this bay is littered with wreckage. Somewhere in the bay lies the remains of a wartime bomber (Lancaster or Shackleton). There are still witnesses in Lochaline who remember her going down. Ballista: Lost in 1975, while salvaging coal from another ship lost nearby, her funnel is visible at low water making her easy to locate. A good shallow dive or wreck dive for novices, lying in a reasonably sheltered position. HMS Dartmouth: Fifth Rate Royal Naval Frigate lost in 1690 and designated under the Protection of Wrecks Act 1973. This wreck can only be dived under license from Historic Scotland. Thesis: Wreck of a Belfast steamer (151 net tonnes) lost in 1889 lies at right angles to the shore, with her bow in 12 metres, and her stern in 30-35 metres. Structurally intact and encrusted with marine life. Fantastic photographic dive. The Swan: This wreck of a small warship lost in 1653, lies against the rocks beneath Duart Castle and is currently being investigated by professional underwater archaeologists. She is designated under the Protection of Wrecks Act 1973. This wreck can only be dived under license from Historic Scotland by prior arrangement. These are some of the dive sites easily accessible from Salen Pier.